No matter how hard you try, it seems like scammers get your email address. There’s lots of ways they manage to find it, and when they do, they start phishing and hope you fall for their lure. Their goal is trick you into clicking a link or responding with information they can use to steal your identity (or from your bank account!). In the last few weeks, customers have reported two different phishing email scams that look like they came from us—but they didn’t. Here’s what you should be looking out for and what you should do if you received one or both of these emails. 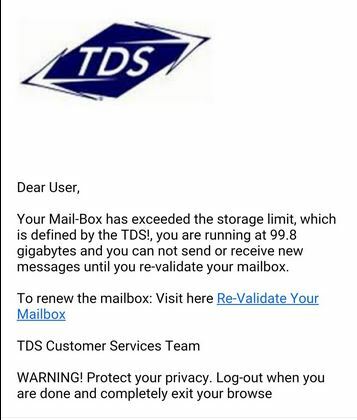 From: “TDS Customer Service” (but a closer reveals the actual the email address is something like dlwray@wildblue.net —not from TDS). The email references “YOUR MONTHLY BILL,” says your payment was declined, and tells you to update your information online by following a link. 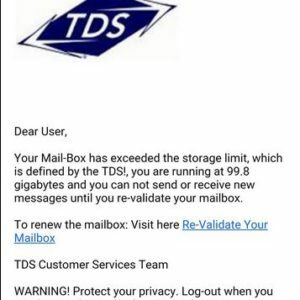 This email tells you that your “mail-box” has exceeded the storage limit and, if you want to send and receive messages, you have to “re-validate your mailbox.” A link is included so you can re-validate. This phishing email even goes the extra mile to try and make it look legit by saying, “WARNING! Protect your privacy. Log-out when you are down and completely exit your browse” (we’ll just ignore the bad spelling of “browser”). Delete the email. Or, at the very least, do not do #2. Do not click on the link! This is how the scammers steal your information. Clicking on a link either takes you to a website that looks real so you’ll give them the information they want, or it automatically downloads malware onto your computer. That malware could do things like track your keystrokes so you unknowingly share the information the scammers are looking for. If you opened the email, clicked one of the links and logged in then you need to change your TDS account password immediately. You can change your password by logging in to My Account on the TDS website. You can also call 1-888-CALL TDS if you need assistance please have your Account PIN ready when you call. If you provided credit card information we suggest you contact your credit card company and have a new card issued. What’s next? Stay vigilant and always think twice before you take an email at face value—especially one that tells you that you must respond or face dire consequences.